Yesterday I had the privilege to attend a conference featuring Tony Attwood in Harrisburg, Pennsylvania. It turned out to be quite an amazing experience, in large part due to my chance to meet Dr. Attwood and to share my cartoons with him. But that came at the end of a long and informative day, so I’m jumping ahead of myself. I have wanted to go to an autism conference for some time, and this was my first chance. It was a two-hour drive to Harrisburg, so I had to set out very early (in the dark and the fog) to make the 8:30 start. It’s a rather beautiful city, from what I saw of it, although there was horrendous traffic coming home as we crawled a half a mile in a half hour along Route 11. Hopefully, I just caught Harrisburg on a bad day. It was a Very Important Conference! The conference was mostly attended by professionals, teachers, and parents, as indicated by their asking for a show of hands at the introduction. There were a few people with Asperger's, but they didn't ask us to raise our hands (even though we were encouraged to attend with a special discounted rate). In Australia, he said, the Aspies speak with an American accent because they learn language from TV. This was one of many comments that drew laughs throughout the day. On the subject of AS being hereditary: "If someone didn't fall in love with an Aspie, it would have died out years ago!" He described the feeling of being a ghost in a crowd of people when no one is noticing or responding to you. He spent some time promoting some of his latest projects, including the CAT Kit for visualizing feelings, and the Exploring Feelings Program. He spoke at length about Asperger's in girls and how they camouflage it. He mentioned Gary McKinnon and suggested he should be hired by the CIA rather than prosecuted for cracking codes. He talked about his remarkable Aspie sister-in-law who married a man 30 years older, and their happy marriage which lasted 27 years until his death. To an audience question on the proposed changes in the DSM-V, he voiced his opposition to the removal of Asperger's. The term helps many, he said, and changing it will not help understanding. “Mild autism” is not mild for the person who’s got it, and is more likely to be met with skepticism upon disclosure. “What are they thinking? They don’t realize the consequences [of removing Asperger’s,]” he said. To another question on whether AS should be disclosed in a job interview, he advised to be cautious, perhaps wait until you've got the job, or prepare a brochure listing your strengths and weaknesses. Dr. Attwood was a very engaging speaker and easy to listen to for 6 hours. I highly recommend you go and see him if you get a chance. Which brings me to the end of the day when he graciously stuck around for book signings and an informal meet and greet. I came prepared with my copy of “The Complete Guide to Asperger’s Syndrome,” just in case. I also brought a copy of “Dude, I’m An Aspie!” thinking I might show it to some fellow attendees. When the time came to meet the “Asperger’s guru,” as intimidating as it was, I picked up both books and took my place in line. Much to my surprise and delight, Dr. Attwood not only wanted to look at my book, but he very much enjoyed it. 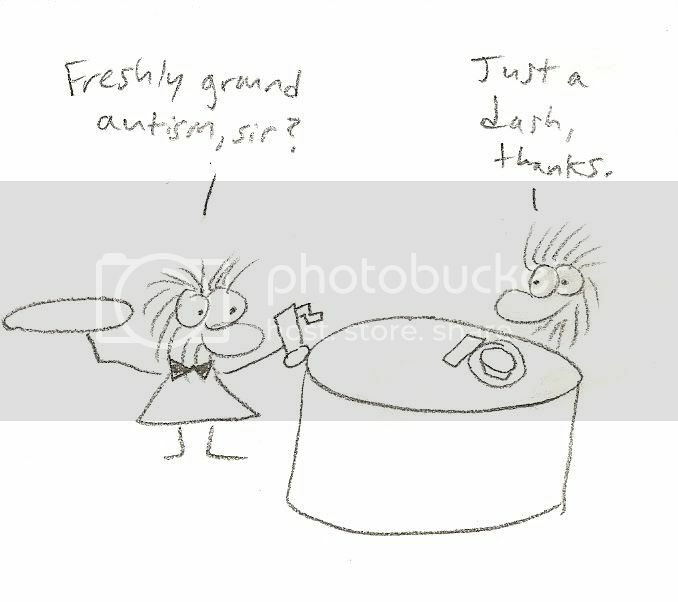 He laughed out loud at the “freshly ground autism/just a dash” cartoon. "This should be published!" he said, leafing through the pages. The conference organizer, who is also a publisher of autism books, was standing next to us, and she took my information and asked me to send her a copy. I only had the one copy on me, and Dr. Attwood said, “I’m keeping this one, since I love it so much!” (Of course I said yes, even though it was my own copy!) Then he asked, “Would you sign it for me? We’ll trade!” So I did. All in all, it was quite thrilling. No matter what comes of this, to get such a compliment from someone whose book I referenced in my own, means a great deal. You just never know. I guess that’s why I didn’t mind the traffic so much, inching along the congested Route 11, unable to wipe the ear-to-ear grin off my face. That sounds like an awesome experience Matt. I am so happy you had the chance to attend. It was very cool that you thought to bring your book. I hope they pass on to their publisher friends. oh my gooooood!! i'm so sorry, i just realised i did something thoughtless and stupid like a few weeks ago, i just copied your cartoon and put it up on my blog since i was too struggling with explaining what AS is to my family.....i left your (WP) username on it though, but do you want me to take it down?? huh just a question, how are you going to send a copy to the woman if dr Attwood has the only one?? hope everything goes the right way :) tell me what to do about my blog, if my putting the cartoon up there bothers you i'll take it down. That sounds like an amazing experience! I can't wait to hear how it turns out for you! And I love that cartoon. The conference was a little too far for me to drive, but I hope to catch one of their conferences next time they're in the Philly area. clarinette, you have permission to use the images from this blog only, as this is the official version. Thanks.